The Bank of Baroda (BoB) on Monday became the second-largest state-owned lender after merging Dena Bank and Vijaya Bank into itself as part of the first three-way amalgamation. The consolidated entity started operations with a business mix of over Rs 15 lakh crore of balance sheets, with deposits and advances of Rs 8.75 lakh crore and Rs 6.25 lakh crore, respectively. Bank of Baroda now has over 9,500 branches, 13,400 ATMs and 85,000 employees to serve 12 crore customers. Meanwhile, Bank of Baroda completed share allotment to shareholders Dena Bank and Vijaya Bank as per the scheme of amalgamation. Shareholders of Vijaya Bank got 402 equity shares of Bank of Baroda for every 1,000 shares held. In the case of Dena Bank, its shareholders received 110 shares of Bank of Baroda for every 1,000 shares. 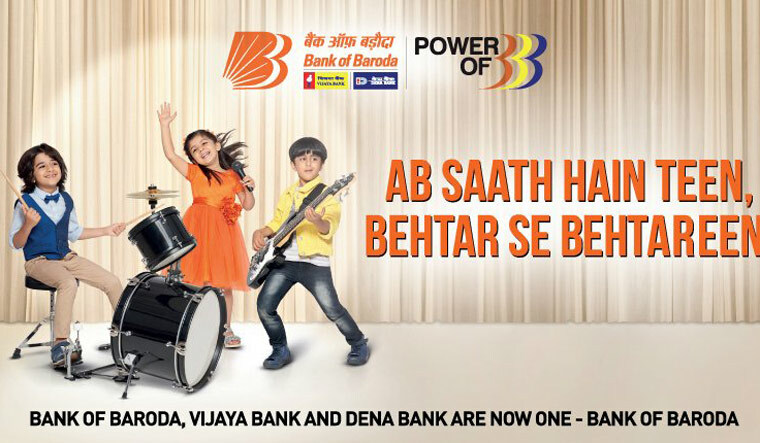 The bank on Monday issued and allotted equity shares at approved share exchange ratio pursuant to ‘Amalgamation of Vijaya Bank and Dena Bank with Bank of Baroda Scheme, 2019’, Bank of Baroda said in a regulatory filing. Post-amalgamation, Bank of Baroda will have a 22 per cent market share in Gujarat and 8-10 per cent market share in Maharashtra, Karnataka, Rajasthan and Uttar Pradesh, the bank has said. All customers of Dena Bank, which is under prompt corrective action (PCA) framework of the RBI, will have renewed access to credit facilities immediately. The announcement of the three-way merger was among several reform initiatives undertaken by Financial Services Secretary Rajiv Kumar to make public sector banks (PSBs) healthy, robust and globally competitive. As part of the reform process, the Narendra Modi government had also announced transfer of majority 51 per cent stake to Life Insurance Corporation (LIC) in IDBI Bank in August last year to transform the Mumbai-based lender. Besides, the Department of Financial Services made a record capital infusion of Rs 1.06 lakh crore in the PSBs in the fiscal 2018-19. As a result, five public sector banks including Bank of India, Corporation Bank and Allahabad Bank were out of the prompt corrective action framework of the RBI earlier this year. Non-performing assets (NPAs) showed a negative trend in 2018-19 and reduced by Rs 23,860 crore between April-September 2018.